An annual service will keep your appliance running efficiently and reliably. Carried out by an OFTEC Registered Technician for your safety and peace of mind. Providing a first class service is our priority, strictly adhering to manufacturers requirements and OFTEC recommendations, we can provide a complete annual oil boiler service solution at very competitive rates. We take care of scheduling, contacting you in advance to arrange your annual boiler service when it is due. Call us today and we will take care of all your oil boiler servicing & maintenance needs. Prompt Response, Oftec Registered - Competitive Rates. Ensure reliability from your oil boiler with an annual oil boiler service carried out by an OFTEC registered technician. For your safety and peace of mind as well as prolonging the lifetime and ensuring the efficiency of your oil boiler - saving money too! Annual oil boiler servicing is important - We attend, repair and test our work as efficiently as possible, our work is guaranteed and we are happy to answer any questions you may have. 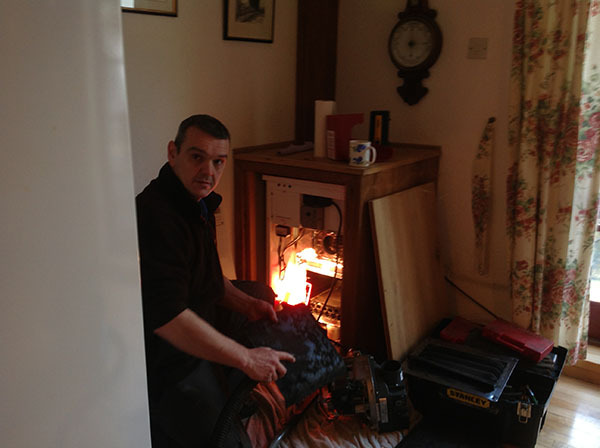 If your Oil boiler breaks down - call us we are your local Oil Fired Heating Engineers. For emergency Oil boiler repair, we offer a prompt oil boiler breakdown service. See the Oil Boiler Breakdown Page for further information. Or see the Contact Us page for contact information, if you have any queries - we would be happy to help. *Please note we do not deal with vaporising appliances. We would recommend contacting Simon Cameron of Classic Heat with any enquiries on 07966 150688. Simon would be happy to help.